Skulls are gameplay modifiers with the appearance of a human skull featured in Halo: The Master Chief Collection. 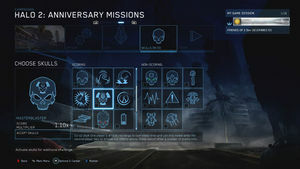 Like in Halo 3: ODST, Halo: Reach and Halo 4, the skulls are no longer easter eggs in-game, and can also be accessed in the campaign menu without claiming them in campaign levels. A total 37 skulls are included in the collection, including several unique additions to Halo 2: Anniversary. Skulls in The Master Chief Collection are divided into two categories: Scoring and Non-Scoring. Scoring skulls increase the challenge and reward players with higher score multipliers or bonuses to base enemy values when turned on. Non-Scoring skulls can either be neutral, such as Grunt Birthday Party, or in cases of cheat-like skulls, have a score multiplier of zero. Zero multiplier skulls like Scarab disqualify level times and scores from being recorded on the leaderboard and disable score and time-based achievements. The games in which the skull is available are listed below each skull. Pre-order skulls are marked with an * and unlocked globally on December 12, 2014. With the exception of these as well as the Swarm skulls, all other skulls are unlocked from the start. Additionally, the Blind, Anger, Catch, Ghost, Sputnik, That's Just Wrong, Thunderstorm and Tough Luck skulls were not useable in Halo: Combat Evolved Anniversary at launch, but were implemented via updates in the MCC Insider Program. "Enemies fire their weapons faster and more frequently." "All enemies in the game are permanently cloaked." "Your shields only recharge when you melee enemies. Bash your way to better health!" "HUD and weapon do not display onscreen." "Co-op skull: When one player dies, the other player gets a large damage boost that lasts a while." "Explosions have twice the damage radius. Light fuse, run away." "Enemies throw and drop more grenades." "Acceleration from explosions is increased." "Chief trades his flashlight for Active Camo." "Auto aim features disabled for all weapons. You'll miss it when it's gone." "Weapons dropped by AI have half the ammo they normally would. You might want to pack an extra magazine." "Player and enemy melee strikes impart more movement physics." "The motion tracker is disabled. You'll miss those eyes in the back of your head." "Covenant weapons: How do they work? Players cannot pick up or use Covenant weapons." "AI no longer flinch from attacks." "Grunt headshots lead to glorious celebrations." Note: the plasma grenade explosion effect from the original Halo 2 is replaced with the confetti and cheering effect from later games. "Grunts die in a blaze of glory. And plasma." "Death carries a heavy price. Dying in co-op resets you at your last saved checkpoint. Dying solo restarts the level." "Rare combat dialogue becomes more common." "Players can only enter ground vehicles by boarding." "Every time you respawn, a random element of your HUD is disabled." "Co-op skull: One player's shields recharge to overshield level and can only melee while the second player has no shields but infinite ammo. Roles switch after a number of enemy kills." "Punching enemies makes them drop grenades. Beat them 'til candy comes out!" "Punch that Prophet up to 11." (each punch the player lands on the Prophet of Regret on the level Regret is accompanied by an electric guitar lick). "Every shot is worth twice the ammo. Save those bullets, playa." "All player-held weapons fire Scarab Gun beams." "Enraged Brutes explode like a frag grenade if not dispatched within seconds. Base Brute score values are increased." "Mass of objects is decreased, making them more easily displaced." "Player shields constantly decay at a slow pace but recharge some with every enemy kill." "Hunters are much stronger. Base Hunter score values are increased." "Increases enemy awareness of player." "Flood Combat Forms spawned by Infection Forms reanimating a corpse are much more dangerous. Flood Combat Form score values are increased." "Upgrades the rank of most enemies." "Enemy resistances and weaknesses are increased." "Enemies always go berserk, always dive out of the way, never flee."